St Brides Major is a village situated in the western reaches of the Vale of Glamorgan approximately 4 miles from Bridgend and 20 miles from Cardiff. It is close to the coast being only a mile or so away from Dunraven Bay and the Galmorgan Heritage Coast. The village has a population of just under 2000 residents and benefits from a primary school, village shop and two public houses. A number of clubs and societies meet at the local village hall as well as the Vale Explorer Scout unit in the nearby Scout Lodge. 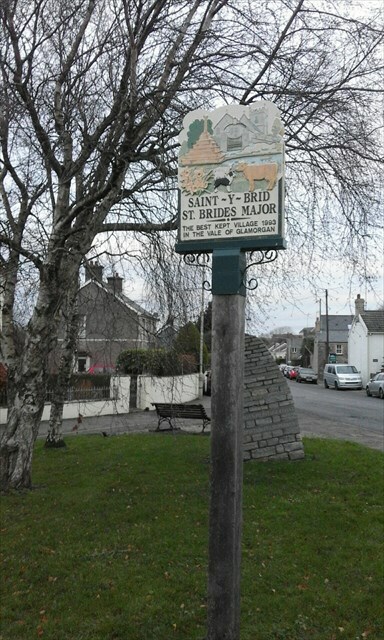 One of the features of the village is Pitcot Pool along with the old village pump which was restored (although not to pump water) in commemoration of St Brides Major winning the best kept village in the Vale of Glamorgan in 1993, which incidentally is also commemorated on the village sign. Further details about the village and its history can be found on the St Brides Major village web site. At the listed coordinates you will find the St Brides Major village sign and also the war memorial. The cache can be found by gathering information from the war memorial, and is a short stroll away. Street parking is available close to the listed coordinates but it can get busy at school run times and please be mindful of residents. Bring your own pen.